عن انس رضي الله عنه ، قال : سمعت رسول الله صلي الله عليه وسلم يقول : ( قال الله تعالى : يا ابن ادم ! إنك ما دعـوتـني ورجوتـني غفرت لك على ما كان منك ولا أبالي ، يا ابن آدم ! لو بلغـت ذنـوبك عـنان السماء ، ثم استغـفـرتـني غـفـرت لك ، يا ابن آدم ! إنك لو اتيتني بقراب الأرض خطايا ثم لقيتـني لا تـشـرك بي شيئا لأتـيـتـك بقرابها مغـفـرة ). Allaah the Almighty has said : O Son of Aadam, as long as you invoke Me and ask of Me, I shall forgive you for what you have done, and I shall not mind. O Son of Aadam, were your sins to reach the clouds of the sky and you then asked forgiveness from Me, I would forgive you. O Son of Aadam, were you to come to Me with sins nearly as great as the Earth, and were you then to face Me, ascribing no partner to Me, I would bring you forgiveness nearly as great as it [too]. It was related by at-Tirmidhee, who said that it was a Hasan hadeeth. yaa 'ibna Aadam, 'innaka maa da3awtanee wa rajawtanee, ghafartu laka 3alaa maa kaana minka wa laa 'ubaalee. yaa bana Aadam law balaghat dhunoobuka 3anaan as-samaa'ee thumma astaghfaratanee, ghafartu lak. "Allah the Almighty has said: 'O son of Adam, so long as you call upon Me, and hope in Me, I shall forgive you for what you have done, and I shall not mind. O son of Adam, were your sins to reach the clouds in the sky and were you then to ask forgiveness of Me, I shall forgive you. O son of Adam, were you to come to Me with an earthful of sins and were you then to face Me, without having associated anything with Me, I shall grant you an earthful of pardon.'" The main message of this hadith is calling upon Muslims to repent sincerely to Allah and to seek His forgiveness. There are three means or ways which enable a Muslim to be forgiven by Allah. And your Lord said: Call upon me, I will respond to you. The Prophet, sallallahu 'alayhi wasallam, said: "Supplication is the essence of worship" [Al-Tirmidhi]. The Prophet, sallallahu 'alayhi wasallam, also said: "Supplicate to Allah as if you are certain about His response." Supplication is guaranteed that Allah will attend to or respond to it when certain conditions are fulfilled. At the same time there are other things that a Muslim should avoid doing in order for his supplication to be answered. The conditions of supplication have been discussed in previous hadiths. The most important thing is the full concentration and attention of the heart and to have full hope that Allah will respond to that du'a and not to rush it. Muslims have to practice supplication frequently because it is a continuous process. Among the things that a Muslim asks Allah in his supplication are to forgive his sins, to be saved from the Hell-Fire and to be among those who enter Paradise. Muslims have to make du'a with full hope that there is a response. Allah says in a Hadith Qudsi: "I am as My servant expects of Me." [Muslim]. The Prophet, sallallahu 'alayhi wasallam, says in another hadith: "No Muslim who supplicates a supplication, that does not contain any sin or cutting of relations, Allah will grant him one of three things: either Allah will immediately respond to his supplication, or He may keep or store the answer for the Hereafter, or He will turn away from him an equivalent amount of evil or harm." The Companions asked what if they keep requesting Allah. The Prophet, sallallahu 'alayhi wasallam, replied: "Then Allah shall give you even both." [Imam Ahmad]. O My servants, who have transgressed against themselves! Despair not of the Mercy of Allah. Verily, Allah forgives all sins. Truly He is Oft-Forgiving, Most Merciful. And whoever does evil or wrongs himself but afterwards seeks Allah's Forgiveness, he will find Allah Oft-Forgiving, Most Merciful. Verily! Allah forgives not the setting up partners (in worship) with Him, but He forgives whom He wills sins other than that, and whoever sets up partners in worship with Allah has indeed strayed far away. Tawhid, as the scholars say, melts away sins. Through fulfilling all the obligations of Tawhid, Muslims are going to be forgiven and rewarded. 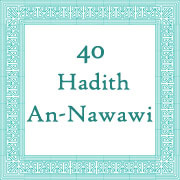 In a previous hadith in this collection of Imam Nawawi's Forty Hadith, we discussed the importance of the realisation of of the idea of Tawhid where Muslims have to love, fear, and glorify Allah the most. By Tawhid, Muslims seek refuge only in Allah and ask support and help from only Him. All of these great actions of Tawhid, which means that the heart becomes fully devoted to Allah, enable the Muslims to be true believers and Muwahideen. Only then Muslims will become enlightened, inspired, and their iman or faith will be strengthened and their sins will be forgiven. By realising the idea of Tawhid, the Muslim also minimises the chances of committing sins because his heart is fully devoted to Allah. Tawhid is the greatest essence of the Message of every Prophet. All the Prophets, peace be upon them, were sent with the Message of Tawhid - that is Allah is the only One Who deserves to be worshipped and to be totally obeyed. Unfortunately, many Muslims today do not observe the realisation of Tawhid. Many Muslims violate Tawhid, for example, there are some groups of Muslims that supplicate and slaughter for dead Muslims. By doing these acts of shirk (associating someone with Allah), they are violating the most important messages of Islam and that is the realisation of Tawhid. If we want to be good Muslims to Allah, we should follow the way that awliya' Allah (closer servants of Allah) followed. We should follow their ways and practices as mentioned in Hadith 38. They had good morals, they loved Allah, feared Him, had total belief or faith in Allah and his Messengers, and they were obedient to Allah and followed His instructions - this included performing good deeds. This obedience was based on fear of Allah, repenting to Allah and submission to His will. Moreover, they were characterised with devotion, honesty, and sincerity. If we want to do it in the right way we should adhere to what is mentioned above and act as the awliya' Allah acted when they were alive. Allah tells us in the Qur'an that this was what led the people of Noah to shirk when they started glorifying and giving their righteous dead people a higher status than they deserved. This led them to worshipping these dead people later on to the extent that some of them made idols of these famous figures. This eventually led to their destruction by Allah. Because of misconceptions or the misunderstanding of the essence of the Message of Tawhid, many Muslims today carry out bad or prohibited acts. Some of them may be excused because of one reason or another, but these are terrible acts that displease Allah and lead to shirk. This is very risky because many Muslims who fall into such categories must rethink about what they do. They should repent to Allah and seek His forgiveness because He is the One who we must seek forgiveness from. He is the one who we should supplicate to and He is the one who we should obey and count on. The realisation of Tawhid is very important for all Muslims. This is the last portion of the hadith. Moreover, it is the last hadith in Imam Nawawi's collection. This is very significant for us as Muslims since this last portion summarises the most important thing in Islam and that is Tawhid. It is a message from Allah to all Muslims to make sure that their Tawhid is sincere and pure. It is important to realise that they should not ascribe any partners with Allah. By doing so, they are assured that they will receive the forgiveness of Allah even if they have committed other sins. Avoiding all forms of shirk, whether sayings or actions apparent or hidden. They should also avoid disobedience or committing sins because sins weaken Tawhid. Avoiding riya' (doing things for self-interest and to please others and not for the sake of Allah). Muslims should also avoid bid'ah or heresy because this will lead to the weakening of Tawhid. Avoiding all forms of hypocrisy specially in repeated actions which are considered as traits of the Munafiqun such as: failing to keep a promise, failing to be entrusted, lying, transgression in quarrels and disputes. In general, Muslims should avoid all illegal acts that will lead to dishonesty, insincerity, and transgression. This hadith mentions three ways which lead to Allah's forgiveness. It should be noted that these are not the only ways. Muslim scholars mention other means and ways of receiving forgiveness, as we have seen in previous hadiths, such as running into hardships, being put on trial, sickness, patience, the torture in the grave, avoiding the major sins, the horrible situations on the Day of Judgement, following the Prophet, sallallahu 'alayhi wasallam, to perform the pillars of Islam, fasting specific days such as the day of Ashura' and the day of Arafah, and the intercession (shafa'ah) of the Prophet, sallallahu 'alayhi wasallam, and the intercession of the believers (which is conditional to Allah's permission and He being pleased with the person).